¶ 1 Leave a comment on paragraph 1 0 The Trump Protest Archive was initially established to collect digital photographs of protest signs, clothing, and other objects related to the inauguration of the forty-fifth American president, Donald Trump. Because of sustained resistance to the president’s agenda and the frequent protest marches in cities across the country in the inauguration’s aftermath, the archive’s focus expanded to include photographic documentation of subsequent protest activities. The Trump Protest Archive is entirely self-funded and all submissions are digital in format. ¶ 2 Leave a comment on paragraph 2 0 Unlike other archives across the United States that collect physical objects and ephemera, the Trump Protest Archive lacks storage and archival space, which led to the creation of an entirely digital apparatus. Built with Omeka, an open-source web-publishing platform created by the Roy Rosenzweig Center for History and New Media at George Mason University, the site employs a relatively simple but effective contribution mechanism that allows members of the public to upload their images, with accompanying metadata, to the archive. The site administrator edits the data for clarity and accuracy, and publishes the contribution to the archive with permission from the photographer. As of May 2017, the site included almost 1,200 submissions from protests across the globe, from New Zealand to Kentucky, from Amsterdam to Iowa. ¶ 3 Leave a comment on paragraph 3 0 The archive solicits contributions strictly via unpaid organic social media marketing, mostly through Facebook and Twitter. 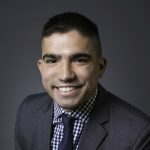 The site’s appeal is broad and often reaches the attention of political protestors, archivists, historians, artists, sociologists, and teachers (not that any of those categories are mutually exclusive). On the site, users can directly contribute images and input metadata for their materials. ¶ 4 Leave a comment on paragraph 4 0 Figure 1. 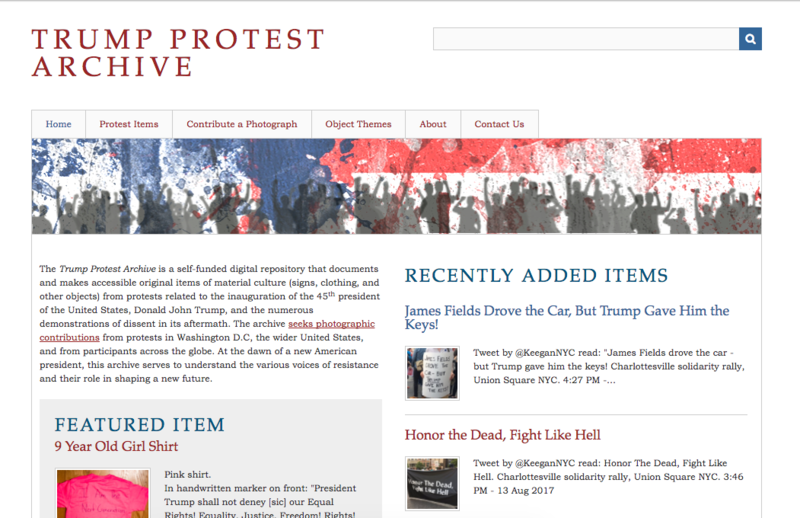 Screenshot of Trump Protest Archive homepage.